The public has a strange relationship with the secular science industry. Some adore it and put their unquestioning faith in it (Scientism), such as I saw years ago in response to a question: "Scientists will come up with a pill for it or something". Others have a mixture of trust and increasing suspicion, especially since the secular science industry has been betraying that trust. Now there's speculation that morality could be done by ingesting certain chemicals. This should raise alarm among thinking people: whose morality? Most likely, it would depend on those in power. Atheists and other secularists have no consistent foundation for morality, and some seek it through evolutionism. Some owlhoots believe that they are doing good when they are doing evil. As a Bible-believing Christian, I do not want secularist "values" shoved down my throat — which could happen literally. Neuroethicists and others thinkers are increasingly absorbed by the idea of “moral enhancement” through pharmaceuticals, implanted brain electrodes or other biomedical means. Leading proponents argue advances in cognitive neuroscience suggest morally desirable capacities may, at least in part, be neurologically-based and therefore amenable to tinkering. Some envision a day when we could use drugs that act directly on the brain to dial down aggression and other “anti-social” sentiments and dial up “pro-social” ones like compassion and trust. To read the entire article, click on "Prescription for Morality?" Evolutionists are on the prod again. A bill was proposed in South Dakota that required...what? What was in it that would cause such distress? Maybe if the bill required the teaching of Intelligent Design, or even biblical creation science, and exclude evolution. That'll be the day! 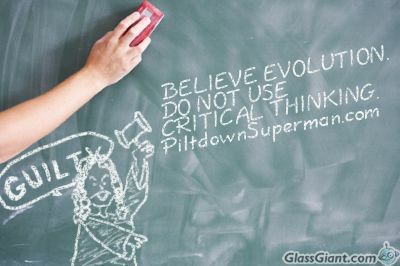 Actually, the "problem" with the bill is that it promotes critical thinking instead of blind acceptance of evolution, so flaws in evolutionary speculations should be made known. The secular science industry has been getting more political nowadays, with a distinct leftist bias. But Machiavellian approaches to evolutionary education have been happening for some time now — it's acceptable to deceive students for the sake of believing evolution. Critical thinking is unacceptable (as is free speech when contrary to leftist causes, atheism, and evolutionary thinking). Unfortunately, true science thrives on critical thinking and challenges, and free speech is also necessary. But atheists and other anti-creationists seek to protect their cult of death from scrutiny, so they unleash Darwin's Flying Monkeys©. No teacher may be prohibited from helping students understand, analyze, critique, or review in an objective scientific manner the strengths and weaknesses of scientific information presented in courses being taught which are aligned with the content standards established pursuant to § 13–3-48. To read the rest, saddle up and ride over to "Fake News on Education Bills".